Your blog about E-Commerce and SALES!! What is the definition of great customer service? To me, customer service is simply living up to your promises. Doing a good job and being able to answer my questions if I have any. But guess what? “A good job” is very subjective. I might consider something a job well done, whereas someone else might be entirely unhappy with the service. So how can we give everyone good customer service if everyone has different expectations? Everyone knows the golden rule of dealing with people; treat people the way you would want to be treated. Unfortunately, the golden rule is a bit short sighted, because you and I are different people and therefore we may want to be treated differently. The platinum rule simply says you should ask someone how they want to be treated, and then treat them that way. Simple isn’t it? Do this and you are one step closer to delivering great customer service, because it helps you identify your customer’s expectations. If you think you can complete the job before the end of the week, tell your client it will be next week. If you think your service will cost 100, tell your prospect it will most likely come down to 120. If you know it will be at least five days before you will be able to deliver, make it ten. It sounds so easy to under-promise and over deliver. But how often do we get an unexpected surprise from one of our suppliers, shops or delivery companies? If you cannot deliver what you promise you’re not even deliver good services you’re delivering no service. Exceeding your promises to you customer, that’s great service. Managing expectations is related to under-promising. You should know what your client is expecting if you’ve asked him properly (see the platinum rule). But sometimes prospects just expect too much. And because they’ve never done business with you they don’t know what to expect. The way to manage someone’s expectations is by asking him what he is expecting and then communicating clearly. Give people as much information as possible. Keep them up to date on what is happening all the time and they will know what to expect. They will expect what you want them to expect, allowing you to be true to your word. Combine these three rules when you are delivering a service to your clients and you won’t let anyone down. Go the extra mile and your customers will come back for more, guaranteed! 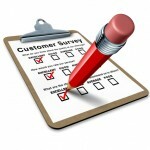 Question: What does “great customer service” mean to you? One Response to "3 Secrets to Delivering Great Customer Service"
It conveys confidence in your customer care, services or products. When you ask only for suggestions on how to improve, it suggests you’re aware of things that are going wrong and don’t expect people to have great things to say.